This week end we are having a lot of company. Pat and Barbara, Jan’s high school friends (actually she has known Barbara since second grade) are coming to the quilt festival and staying two nights. The following day my sister Karen will be spending the night. This leaves me with lots of planning and cooking to do. Pat does not eat “smart” animals, so that means no pork or beef. Barbara does not eat raw tomatoes, so no caprese salads. When we go to Pat’s, she almost always serves chicken cacciatore and I had thought about doing that. 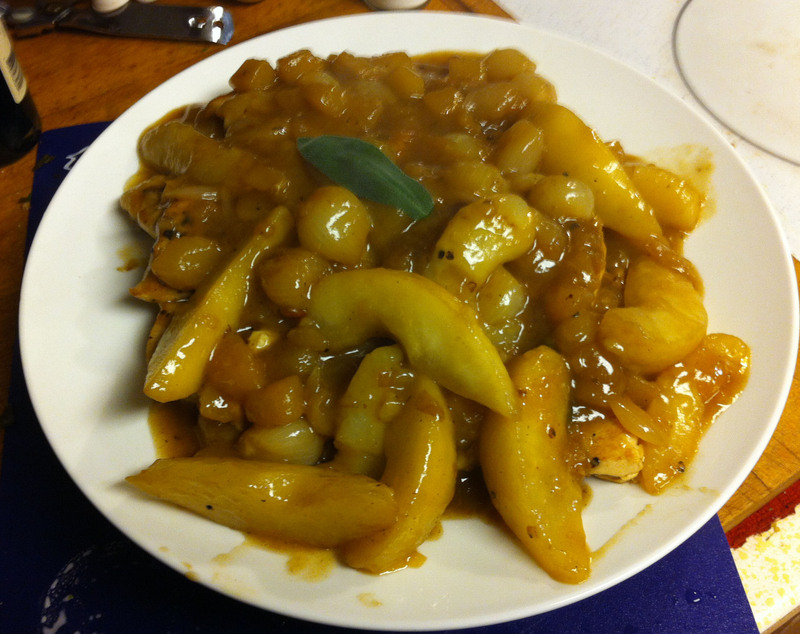 However, as I was looking at recipes, I ran across a chicken and pear recipe that looked really good. Actually, when I had finished changing it to make it my own I found that I had altered almost everything. Still, it is a good start to a meal. Note: This is a good time to repeat my recipe naming philosophy. You may notice that most of the recipes on my blog start with “Karl’s….” This is an organizational, not an ego issue. When I am looking for new ideas I will scan random recipes on the internet. When I find one that catches my eye, I download it to my computer for future reference. When I adapt one of these recipes I give it the name “Karl’s…” to make it clear, to myself, that I have made changes to the original recipe. If I have made only a few minor tweaks, I list a credit and a link to the original recipe. If I have altered a recipe greatly or I am cooking “by the seat of my pants” I usually do not give credit. If you compare the inspiring recipe above with what I came up with today you will understand what I mean. 1. Quarter the Red Anjou pears top to bottom. Peel and core them. Cut the eight pear quarters again in half length-wise. Tip: A carrot peeler was actually the perfect tool for peeling the pears. It took the skin off will almost no waste. 2. Put the pears in a bowl with 2 tablespoons of brandy and toss gently to coat. Let the pears marinate in the brandy for at least one hour. Toss gently occasionally. 3. Peel, core and dice the Bartlett pear. Put them in a second bowl, add the rest brandy and toss roughly. 5. Cut the chicken into 12 pieces. Note: Remove the backbone, first joint of the wing and skin the chicken. Remove the ribs and backbone from the breast. Cut each half breast into four equal pieces, leaving the rest of the wing attached. Cut each leg quarter into thighs and leg. I have tried cutting the breast into three pieces, but Jan usually cuts one of the pieces in half. 6. Sprinkle the chicken lightly with ¾ teaspoon of salt and pepper. 7. Melt one tablespoon of butter in a large sauté pan with a lid. Brown each side of the chicken pieces, in batches, over medium high heat. Remove the chicken to a plate and reserve. Tip: Cook the thighs and legs a bit longer than the breast pieces, but you are not trying to completely cook the chicken at this time. It is OK if it is still a bit raw in the middle. 8. Without cleaning the pan, melt the second tablespoon of butter. Add the shallots, the pearl onions and a pinch of salt to the pan. Sauté over medium high until the shallots are just starting to pick up some color, about three minutes. Stir frequently. 9. Stir in the sage leaves, the chicken broth and the Bartlett pear to the pan. 10. When the broth comes to a boil, reduce the heat to low and cover the pan. Simmer for 15 minutes. 11. Stir to mix the pan ingredients and to break up the pear. 12. Nestle the chicken pieces into the sauce, cover the pan and simmer for another 10 to 15 minutes more. 13. Remove the chicken pieces to a serving platter and tent with foil to keep warm. 14. Gently stir the corn starch and the Red Anjou pears into the sauce and simmer for 5 minutes, covered. Tip: You are only trying to par-cook the pear slices, not turn them into mush. 15. Gently fold in the balsamic vinegar and pour the sauce over the chicken. 16. Garnish with a few fresh sage leaves and serve with Karl’s Herbed Barley.